Following yesterday’s successful lift off, the launch campaign in Kourou is now drawing to a close. 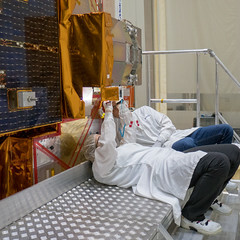 The team in ESA’s European Space Operations Centre in Darmstadt, Germany, is carrying out important checks on the MSG-3 as part of the Launch and Early Orbit Phase (LEOP). LEOP lasts 10 days. If all goes well, MSG-3 is then officially handed over to Eumetsat for in-orbit testing and commissioning, although ESA and industry continue to support this phase. Commissioning ends when the complete satellite and ground systems are verified and validated, so that MSG-3 can be declared ready for operations. This should be in about six months from now. MSG-3 is then renamed Meteosat-10 and will become the prime geostationary satellite providing full disk images of the European and African continents and parts of the Atlantic and Indian oceans, every 15 minutes. Meteosat-9 will deliver more frequent images over Europe – every five minutes, providing the Rapid Scan Service.